Strong Safety Habits as the Gold Standard | MGI Construction Corp.
An unparalleled safety protocol begins with simple reminders and naturally graduates into habit. Habitual actions are difficult to shake, qualifying them as an ideal to shape your health and safety training around. Here, we’ll look at a handful of areas that are prime candidates to target for company’s looking to improve their safety on the construction site. Always be aware of overhead obstructions and underground utilities, including electrical lines, water main, sewer, gas, and telecommunications. 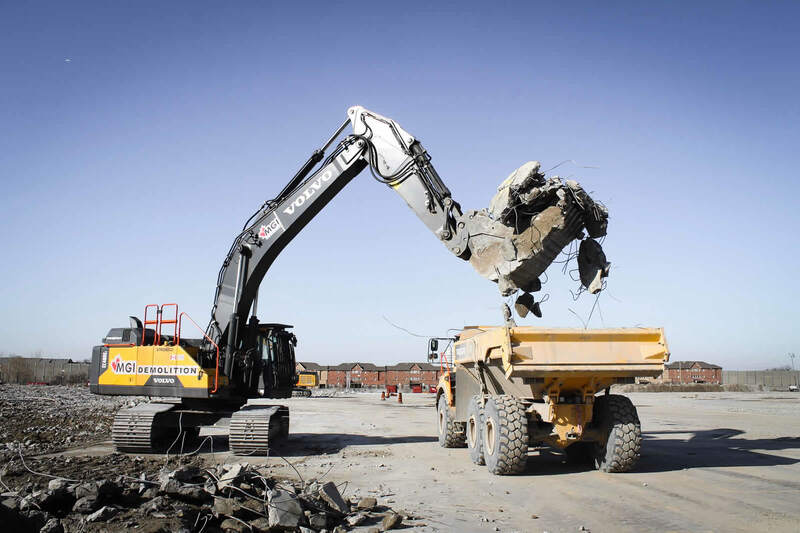 It is important to have locates on-site before starting any type of demolition or excavation. Hitting a utility line could have very serious repercussions. A great practice is to mark or warn of all overhead lines or low clearances either through signage, visibility signals, and/or toolbox talks. Continue to use caution even after underground lines are marked since errors in marking are common. Have laborers prepared to hand dig when excavation is getting ‘close’. Don’t take chances. Reversing motions on anything in this industry is burdened with danger. Backup alarms on construction machinery are mandatory devices that alert others your machine is moving. Even still, operators need to positively assure that no one or nothing is behind them. This is accomplished by getting out and looking or having a qualified spotter. Demolition sites should warrant extra caution as they naturally garner more obstructions. Always check the machine perimeter before moving. When vision is impaired, have spotters (in high-visibility apparel) guide you. Install and use wide angle mirrors. The new generation of machinery is fitted with effectively viewable surface mirrors. Keep them clean and adjusted. Nowadays, technology has allowed us to install and utilize rear-mounted cameras as well. If a machine starts to tip; your seat belt becomes your lifeline. Always use a seat belt—they are there for a reason. A professional will not have to be reminded of this rule. No matter how many times you have operated, no matter how many years of experience you have, all it takes is one accident to change everything. Even with the cab door closed wearing your safety belt is absolutely essential. It decreases how much you will bounce around in the cab during normal operation and may help you control the machine in a borderline upset situation. There are plenty of precautions to take when operating the machinery. When loading or lifting, keep all people well clear. Never lift a load over people. One mistake could crush a human in an instant, which is why anyone on the ground must stay well back from the machine. Never lift a load over people or structures. A lot of serious accidents also occur when trying to use one machine to do multi-tasking. Forklifts, skid steers, and similar multi-use machines are versatile but are often pushed far beyond their limits. Operators must understand their limits and safety is primary. On most job sites, it is clearly listed what safety equipment you need to have to be on the site. Generally, a hard hat, safety boots, and safety glasses are required for all types of construction. These pieces of PPE have been the sole reason for many avoided accidents. Accidents happen in the blink of an eye, which is why it is also important to never remove safety equipment unless you are in a controlled environment far away from any coherent danger. Some jobs require much more than just goggles, hard hats, and boots. Jobs in confined spaces or at heights often require respirators, air regulators, safety harnesses, safety plans, spotters, and two-way radios. There is never a job that is so urgent it cannot be done safely. Mechanics all have a story or two that demonstrates why the OSHA made the lock-out/tag-out (LOTO) rule. Any raised load (or object, such as the bucket or attachment) is subject to LOTO. All pinch points on a machine must be identified and protected (guarded) when possible. The minimum warning is a pictorial decal advising of the hazard. Even something as simple as a broken latter should not just be thrown in the trash, a tag should be placed on the latter informing anyone who may come across the latter of its inherent dangers. The same goes for a faulty extension cord or a broken tool. Always review the manufacturer directions for safety in all cases, even if this is the fifth generation of machine you bought from the same manufacturer. There are diagrams and directions in all manuals to point out safety features, do’s and don’ts, good or bad practices, efficiency measures, etc. These days, the equipment and machinery produced are the safest and most reliable ever made. To get the most out of these tools and ensure your employees’ safety, a comprehensive safety program should not only be in place on all your jobs, it should be relevant, timely, frequently referenced and backed up by top management. Toolbox talks are an essential part of the daily operations on a job. A toolbox talk is a quick meeting with all people on site to review any dangers, unique situations, and act as a quick refresher on safety. What’s most important is promoting a culture of safety within your company. If you see someone or something unsafe it is your duty to speak up. Over time, the goal is to leverage these as a healthy habit.